COSMOS. The updated version of the classic Carl Sagan miniseries has generally been welcomed with open arms by anyone with any interest in space. The show is a great introduction to science and history for younger viewers and a great refresher (or introduction) for older viewers. As a huge astronomy buff and fan of the 1980 miniseries, I will do what anyone who consumed and loved the original version of something and say that this updated version, while good, is just not the same. However, it’s just not the same in a great way. 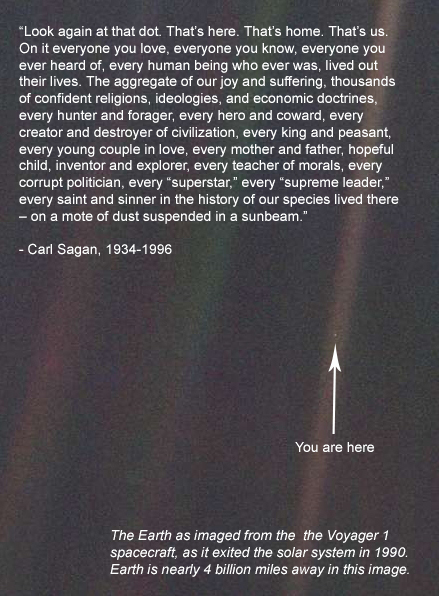 The Pale Blue Dot Quote and Picture. Amazing. The original series did a great job of creating wonder and fascination, but this version does a better job of teaching and explaining complicated topics. Ann Druyan and Steven Soter, the writers of the 1980 version (along with Carl), write all the episodes for this current version. While Ann and Steven could have played it safe and just told us about uncontroversial physics topics and exciting far-away worlds, they decided to challenge Americans to think about our place in the Universe by taking on the highly-controversial topic of climate change. Carl Sagan used his profound ability to teach us about our place in the Universe to challenge the reasoning and logic behind world wars and petty conflict. Ann and Steven boldly use that same ability to challenge our petty reliance on fossil fuels and climate change deniers. I grew up with Neil deGrasse Tyson teaching me about the Universe on PBS or Discovery; many of you probably did as well. It’s therefore fitting for him to be the voice challenging younger generations to take action and reform our disastrous impact on our only home. Episode 12 of Cosmos is without a doubt the best explanation of climate change I have seen or read. The internet has been abuzz about this for a couple weeks, but I am just now getting to the episode and it’s worth a comment. The episode takes controversial issues and makes them uncontroversial. It takes the complexities of Earth Sciences and makes them understandable. It systematically addresses the concerns of those on both sides of the issue and lays to rest any doubts. Please take time today, tomorrow, or this week to watch the full episode. If you have a child of any age, please introduce the series to him or her and watch it together. The way in which we build our cities and develop our land greatly impacts how much carbon dioxide we put into the air. Destroying forests for sprawl development and preventing renewable energy sources from operating on pieces of land greatly contribute to carbon dioxide in the atmosphere, which leads to warmer climates. What we do with our land has a huge impact not just on our communities but on the entire global ecosystem. The EPA’s new carbon dioxide rules represent the greatest environmental gain since the 1970’s, but so much more can be done through progressive local land use regulations. NASA has a great climate change page that is both beautiful and informative. If you’re looking for actual data and science on climate change you should check out their site here. The image used for this article on the homepage is courtesy of erengineering.wordpress.com. It depicts air pollution over China as seen from space. SustainAtlanta on GPB's "On Second Thought"
Atlanta is Suddenly a Top 10 Walkable US City; Really?